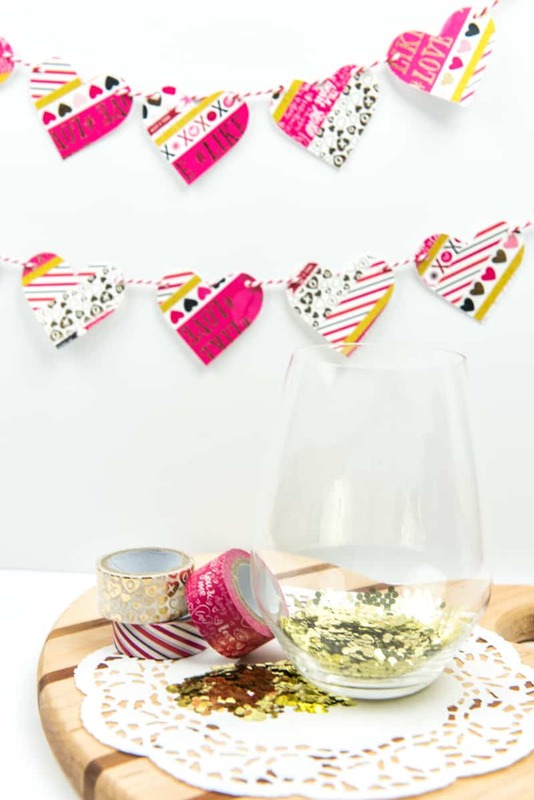 Use your favorite washi tape patterns to create a simple washi tape heart garland for Valentine’s Day! When it comes to paper crafts I am way behind on the times. People have been obsessed with washi tape for months (maybe a few years?) now and I’m just jumping on to the trend. There are so many cute patterns and colors that it’s hard to walk past the aisle at Michaels and not pick up a few more for my collection. Last week I had gone to Michaels to buy one thing (which I didn’t even find!) and saw a sale on Valentine’s Day washi tape. Well, I didn’t know what I would make with it but I knew I had to have it. So I grabbed some, checked out, and went home with no idea what I’d make. It wasn’t until dinner time, as I was watching my toddler squish broccoli in his hair, that I thought of a really fun way to use the tape. And so I came up with the easiest (albeit a bit time consuming) way to make washi tape heart garland! Valentine’s Day was never a big deal in my house growing up. My parents would always get us something small (sometimes balloons, candy, or maybe a gift), but the holiday came and went without much fuss. I’ve adopted the same mentality as I’ve gotten older, and have told Chris that I don’t really want anything besides a nice card on the day (and maybe a nice dinner that I don’t have to cook on the weekend!). Keeping things simple seems to work well for us. Neither of us are huge sweets eaters (though I would be if I kept a lot of that stuff in the house) and after Christmas there really isn’t anything either of us want as gifts. But even though we don’t celebrate Valentine’s Day in big ways I’ve learned that doing small things is more fun than doing nothing. Last week I shared these Heart Straw Toppers for a Valentine’s Day tablescape, which was super fun and such a simple craft! They got me in the mood to do more love stuff, and so I came up with another heart shaped craft for you today. 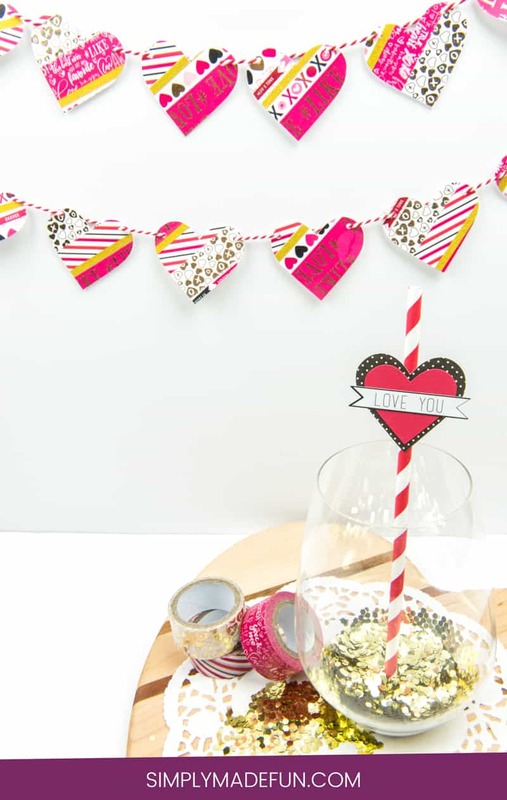 Check out how easy it is to make this washi tape heart garland! 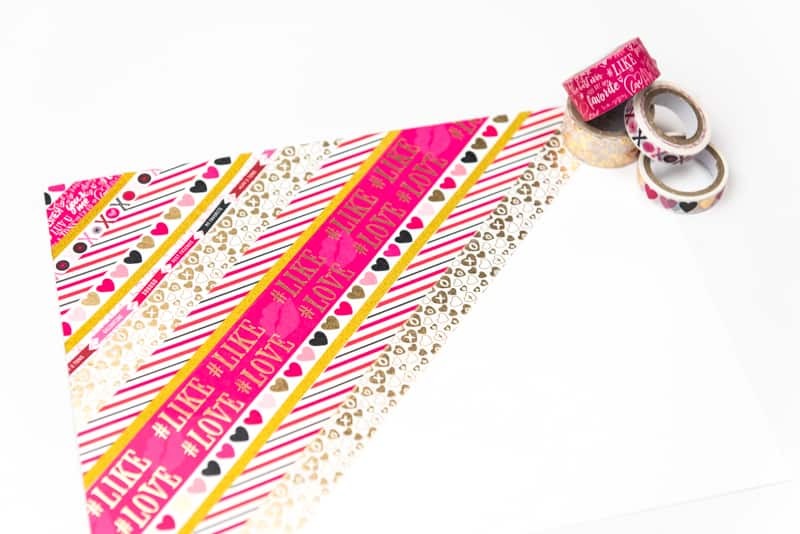 + Start by laying pieces of washi tape on your cardstock. You can lay them straight across or diagonal (I chose diagonal because I liked the pattern! ), whichever you choose! This is the most time consuming part of the project. + Cut hearts out of the washi tape and set them aside. You can use either heart punches (like this one on Amazon) or a Silhouette Machine. + Depending on how you’d like to hang your garland, punch holes in the hearts for the sting. I chose to do one small hole on either side of the heart, but you can do yours anywhere you’d like. + String each heart onto your jute and then hang it up in your home! I love finding simple ways to bring a bit of color into my home for the holiday’s and this washi tape heart garland definitely brings the sparkle and the color! It’s safe to say that I am now obsessed with washi tape and the craft possibilities that come with it. I may have to limit my Michaels visits now, or just stay away from the washi tape aisle. Do you like to craft with washi tape? What are some projects you’ve made with it? Find more easy Valentine’s Day tutorials to try here! Washi tape is one of my favorite items for quick and cute updates. This garland is such a cute way to use it, too!